Want to be notified of new releases in senecajs/ramanujan? This project is an implementation of a microblogging system (similar to the basic functionality of Twitter) using the microservice architecture and Node.js. It is the example system discussed in Chapter 1 of The Tao of Microservices book. The system uses the Seneca microservice framework to provide inter-service communication, and the fuge microservice development tool to manage services on a local development machine. The system is also a demonstration of the SWIM protocol for peer-to-peer service discovery. A service registry is not needed as the network automatically reconfigures as microservices are added and removed. The system shows implementations of some of the essential features of a microblogging system, but not all. Of particular focus is the use of use of separate microservices for separate content pages, the use of messages for data manipulation, and the use of a reactive message flow for scaling. The system does not provide for full accounts, or user authentication. This could be added relatively easily using the seneca-auth and seneca-user plugins. Avoiding the need to login makes it easier to experiment as you can check multiple user experiences in the browser. The system does not use persistent storage. You can easily make the data persistent by using a Seneca data storage plugin. Keeping everything in memory makes for faster development, easier experimentation, and lets you reboot the system if you end up with corrupted data during development. This system also provides an example of message tracing, using Zipkin. This example codebase does not provide a production deployment configuration. 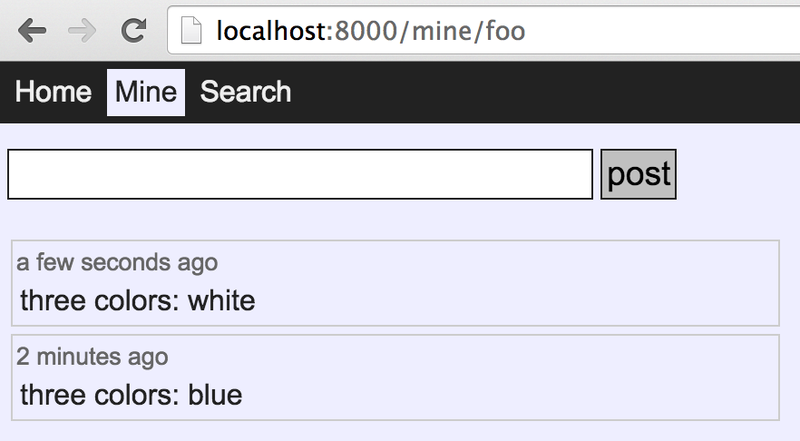 It does however provide a Docker Swarm example that you can start building from. The system also includes example code for unit testing microservices. The unit test code for each service is in the test subfolder of each microservice folder. The microservices can be unit tested independently and offline. Mock messages are used to isolate each microservice from its network dependencies. The system is implemented in Node.js. You will need to have Node.js version 4.0 or greater installed. This starts all the microservices in the background. While this is a quick way to get started, and verify that everything works, it is not the most convenient option. To have more control, you can use fuge to run the microservice processes. Detailed instructions are provided next. 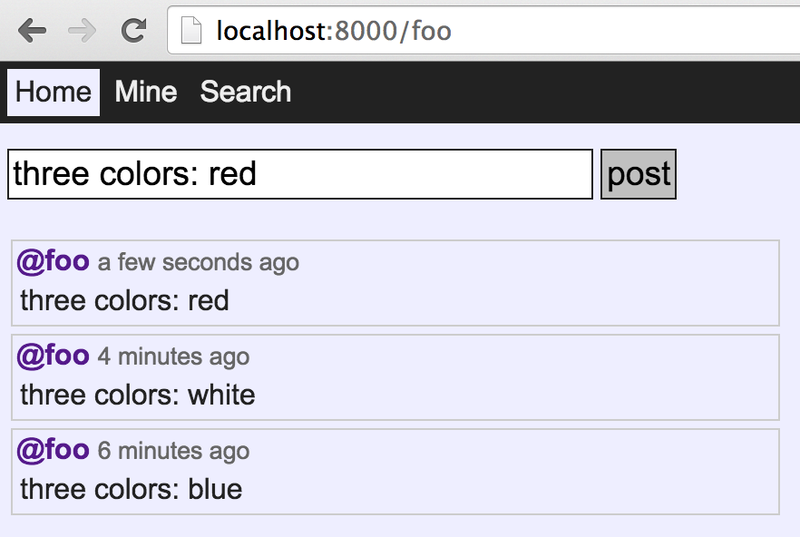 You can also use Docker to run the services. Example Dockerfiles are provided in the docker folder. See below for more details. Follow the instructions at fuge repository. fuge is a development tool that lets you manage and control a microservice system for local development. The ramanjun repository is preconfigured for fuge (see the fuge folder), so you don't have to set anything up. The ramanujan system has 14 microservices (at last count), so you really do need a local tool to help run the system. This is trade-off that you make when you choose the microservice architecture. You can move faster because you have very low coupling, and thus lower technical debt, but you will need more automation to manage the higher number of moving parts. The system needs a number of Node.js modules from npmjs.org to function correctly. These are the only external dependencies. Wait until the downloads complete. Some modules will require local compilation. If you run into problems due to your operating system, using a Linux virtual machine is probably your fastest solution. If you are using Windows, configuring msbuild first is a good place to start. Once you've run through some of the use cases, open http://localhost:9411/ to see the message traces. Note that this is a demonstration system, so all traces are captured. In production you'll want to use a much lower sampling rate - see the Zipkin documentation for details. From within the repository folder, run the fuge shell. Enter the command help to see a list of commands. 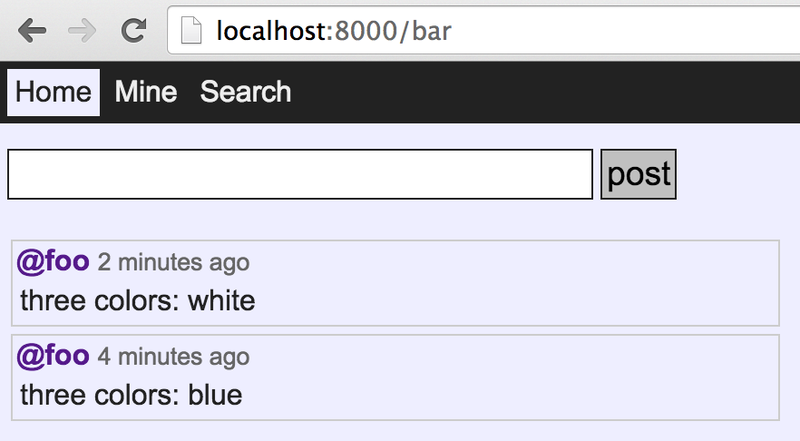 Useful commands are ps to list the status of the services (try it! ), and exit to shutdown all services and exit. If your system state becomes corrupted in some way (this often happens during development due to bugs in microservices), exit fuge completely and restart the fuge shell. You see a list of startup logs from each service. fuge prefixes the logs for each service with the service names, and gives them different colors so they are easy to tell apart. This also makes is easy to review message flows. The system takes about a few seconds to start all microservices. Now use the ps command to list the state of the services. They should all be running. Open your web browser to interact with the system. The steps below define a "happy path" to validate the basic functionality of the system. This is the homepage for the user foo, and shows their timeline. The timeline is a list of recent microblog entries from all users that the user foo follows, and also entries from foo themselves. Click the post button or hit return. You should see the new entry. You should see both entries listed, with the most recent one at the top. This is the timeline for user foo. Open http://localhost:8000/mine/foo (Or click on the Mine navigation tab). This shows only the entries for user foo, omitting entries for followers. You can use this page to verify the entry list for a given user. Click on the follow button. Now user bar is following user foo. Open http://localhost:8000/bar (Or click on the Home navigation tab). 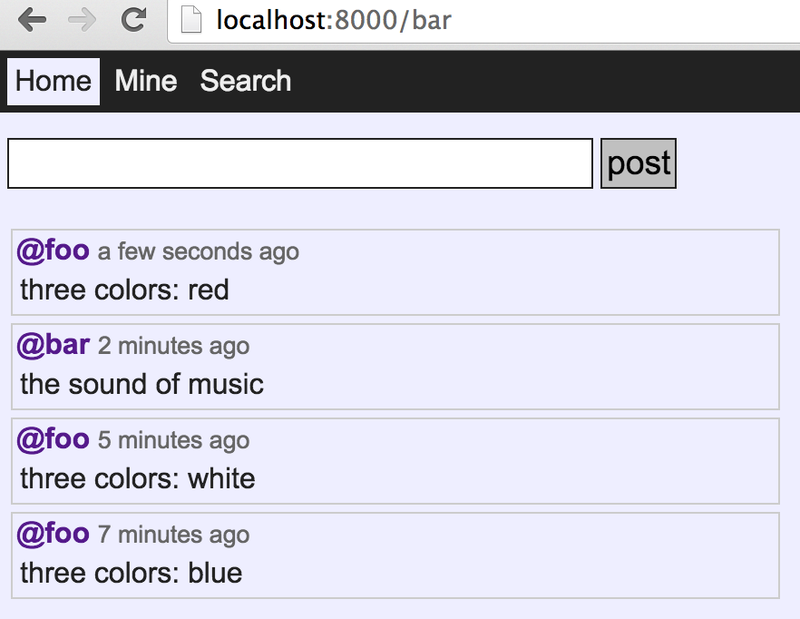 You should see the entries from user foo, as user bar is now a follower. 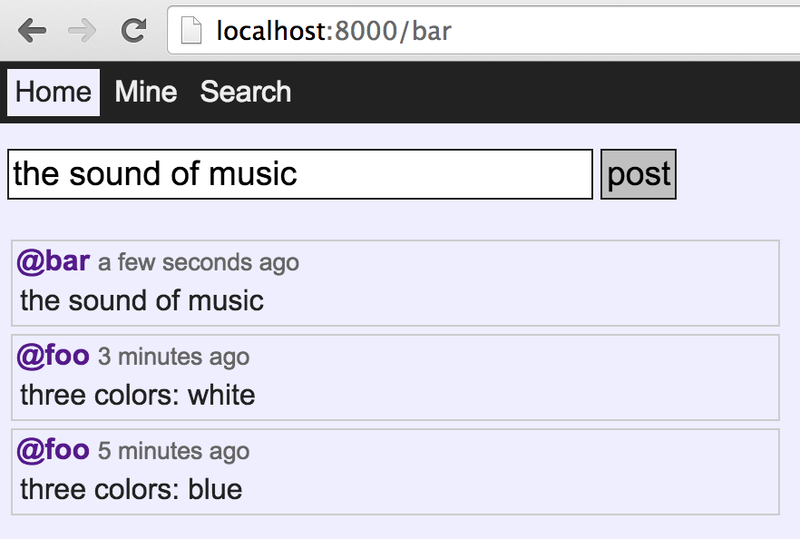 The timeline for user bar now includes entries from both users foo and bar. Return to user foo. Open http://localhost:8000/foo. You should see entries only for user foo, as foo does not follow bar. Go back to user bar. Open http://localhost:8000/bar. You should see an updated list of entries, included all the entries for user foo, as bar does follow foo. One of the main benefits of a microservice system is that you can deploy services independently. In a local development setting this means you should be able to start and stop services independently, without stopping and starting the entire system. This has a huge productivity benefit as you don't have to wait for the entire system to ready itself. To work on a particular service, update the code for that service, and then stop and restart the service to see the new functionality. The rest of the system keeps working. To really get the maximum benefit from this technique, you need to avoid the use of schema validation for your messages, and you must avoid creating hard couplings (services should not know about each other). That is why the Seneca framework provides pattern matching and transport independence as key features - they enable rapid development. The payoff for more deployment complexity is that you can change parts of the system dynamically - don't lose that ability! fuge allows you to start and stop services using the 'start' and 'stop' commands. If you now try to use the search feature, it will fail, but other pages will still work. Another important benefit of microservices is that they can isolate errors in this way. And the search functionality works again. Notice that you did not have to do any manual configuration to let the other services know about the new instance of the search service. Notice also that the other services knew almost instantaneously about the the new instance of the search service. That's becuase the SWIM algorithm propogated that information quickly and efficiently throughout the network. No need for 30 second timeouts to detect errors - SWIM works much more quickly as it has many observers (the other services) so can detect failure, and new services, very quickly with a high degree of confidence. And is you now run the ps command in fuge, you'll see the count is 2 instances. You can enter messages directly into the terminal, in JSON format (the format is lenient, see jsonic). The output will show the message data IN and OUT of the network. This message is so useful, that the repl service defines an alias for it: m.
The default configuration of the system uses shortened identifers to make debugging easier. You can monitor the state of each service, and the message patterns that it responds to, by running the monitor service separately in it's own terminal window. The monitor service prints a table of showing each service, and dynamically updates the table as services come and go. See seneca-mesh for details. You'll need to have the latest version of Docker installed. This will start up everything. The containers run in their own overlay network, but you will be able to access the website and repl on localhost as with fuge. Copyright (c) Richard Rodger and other contributors 2015-2016, Licensed under MIT.